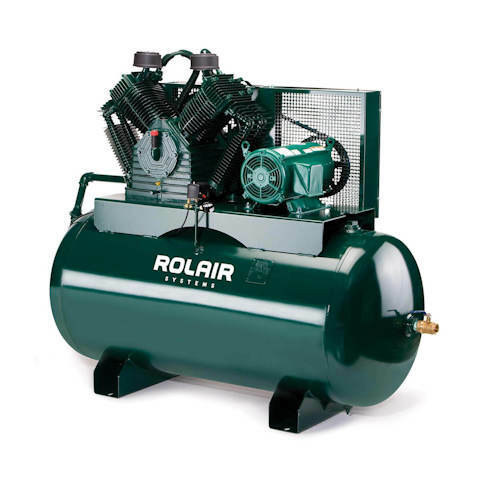 15 to 20 HP, two-stage electric stationary air compressors on a variety of tank configurations. Model H15312K60 shown. Click to view all models in this category. 1800 RPM, 60 Hz, Open Drip-Proof Motor. Three Phase Models Available in 208, 230, and 460 Volt. H15312K60 15 Three 120 Gallons 1740 58.4 @ 175 PSI 46.2 @ 175 PSI 72" 30" 54" 984 lb. H15320K60 15 Three 200 Gallons 1740 58.4 @ 175 PSI 46.2 @ 175 PSI 76" 36" 60" 1,284 lb. H15312K100 15 Three 120 Gallons 1740 60.7 @ 175 PSI 47.3 @ 175 PSI 72" 30" 58" 1,095 lb. H15320K100 15 Three 200 Gallons 1740 60.7 @ 175 PSI 47.3 @ 175 PSI 76" 36" 64" 1,395 lb. H20312K100 20 Three 120 Gallons 1740 75.8 @ 175 PSI 58.4 @ 175 PSI 72" 30" 58" 1,150 lb. H20320K100 20 Three 200 Gallons 1740 75.8 @ 175 PSI 58.4 @ 175 PSI 76" 36" 64" 1,450 lb.